How one train company is engaging with customers to avert a crisis – noteworthy. London Midland, which operate trains from Liverpool to London Euston and other routes besides, is embroiled in a dispute with ASLEF, the train drivers union. Quite what this dispute relates to, I’m not interested. What does interest me, is the way London Midland are engaging with their customers to avert what must surely be a potentially catastrophic scenario for their business. The dispute is manifested in an unwillingness by train drivers to turn up for work. As a result, train cancellations are rife, unpredictable and have been a daily occurrence for over a month now. Compounding the problem is a marked increase in the number of attempted and sometimes successful cable thefts which inevitably cause significant disruption. All-in-all, it’s safe to say, the situation is pretty dire. However, rather than throw metaphorical hands up in the air and wear an expression of ‘what can you do?’ London Midland have embarked upon a strategy of providing as much real-time information as possible using email, Twitter and a desktop widget as their communications channels. (I’m not including their website as I’m more interested in the ‘push’ aspect of their strategy). Since the dispute began, London Midland’s Twitter following has risen steeply, and now approaches 5000. Updates are regular and it seems, focussed on answering questions and concerns rather than simply pushing timetable alterations. The flow of communication is constant and, given the inevitably irritable nature of many inconvenienced customers, undoubtedly challenging. Regular apologies punctuate the tweeted replies and the tone of voice is personal rather than corporate. Now for the email: Using a mechanism by which customers specify the time slots in which they will be travelling, London Midland have set up an automated email notification, informing customers of any known disruption prior to their specified travel times. The system seems to work. How do I know? I use it. Sadly, I can’t comment on the widget as it only works with Windows 7 or erm, Vista..(I have a Mac). I’ve been travelling London Midland for the past month or so and have been regularly caught up in the disruption. It is often incredibly frustrating. But the legitimacy of the dispute and whoever is culpable for the disruption aside, I can’t help but be impressed by the way the company has addressed the need to communicate with customers. 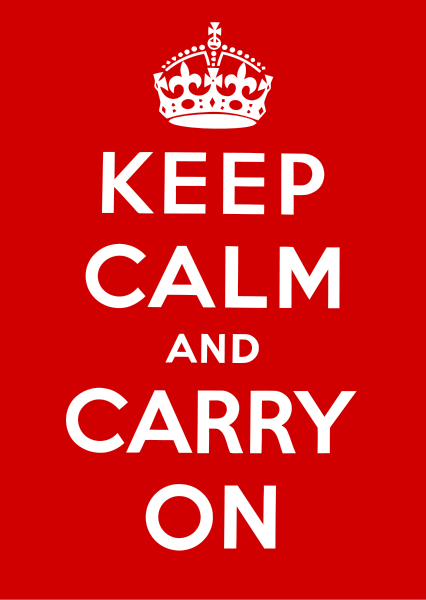 I am not in any way indebted to London Midland (their trains are cramped and in many ways, inappropriate for the length of journeys) but I believe they deserve real credit for Keeping Calm and Carrying On. Now can we have normal service back? This entry was posted in Branded Content, Marketing and tagged brand communication, linkedin, London midland, trains, twitter. Bookmark the permalink.